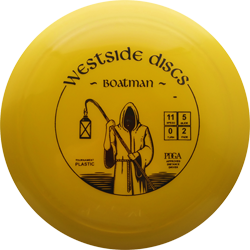 The Westside Boatman is one of our fastest drivers that was designed to fit all sizes of hands. It will give you that fast flight and is very predictable. It has a very long glide with very little fade. For faster arm speeds it will hold the line and has a very overstable finish. For slower arm speeds you will be able to count on an overstable finish but will give you that extra glide you are looking for without having to grip such a big rim. VIP plastic is our most durable plastic. It comes in a nice see through and opaque appearance. It has a tacky grip nice glossy finish. Designed with super resistant polymers to withstand great force, still hold its shape, and maintain original flight characteristics. No matter what you hit VIP will show great resilience and fly the same the next time you throw it.